Here at Mosaik Design & Remodeling, we love when design trends for yesteryear return with a modern twist. Nowhere is this more apparent now than with mid-century modern design. Initially popular in the years after the second world war, mid-century modern design has come back in a big way. 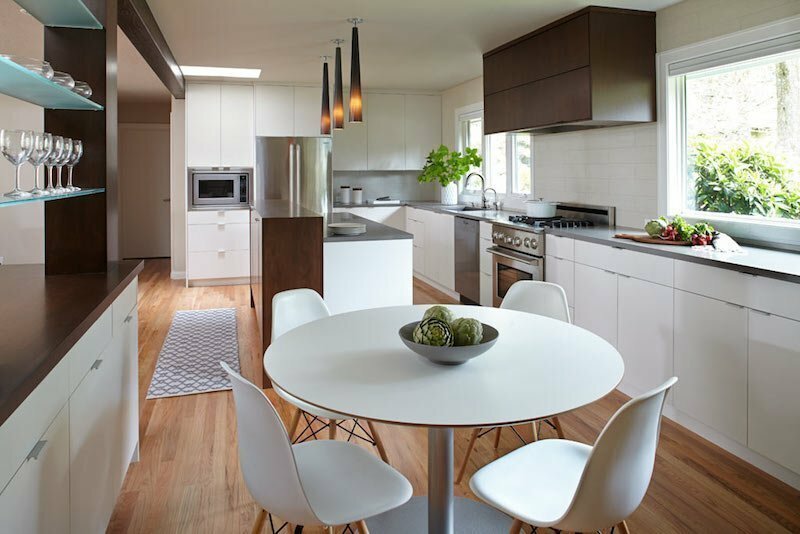 Centered around open floor plans, natural light, and simplistic design elements, this trend fits perfectly with a modern Portland lifestyle. In this month’s post, we’ll take a look at what this trend is all about. Then, we’ll go over some ways to easily integrate these concepts into your home. Mid-century modern design roots are found in the German Bauhaus school of design. During World War II, many of the architects from that school of design immigrated to the United States. This immigration had a profound effect on art and architecture in the United States after the war, including with the development and rise of mid-century modern design. One of the most beautiful aspects of mid-century modern design is its use of mixed materials and colors. Often, traditional and rare materials are even used at the same time to create an interesting juxtaposition to contrast one another. This can help create a truly unique aesthetic that can only be found with this style of design. For mid-century modern design, one piece can make all the difference. A classic look for this style is a vintage, worn-in piece of furniture. One large statement piece (such as a solid colored sofa) can transform your living room. There are a number of retailers where you can find new, vintage inspired pieces. Here in Portland, you can find many reputable vintage pre-owned stores where you can find one-of-a-kind items that are in like-new condition. Re-painting your home in an understated tone is an easy way to refashion your space into a mid-century room. To do this, accent your room in conjunction with the items already in it. For instance, do you have a funky kitchen table in your breakfast nook? Paint in accordance with the table as opposed to the other way around. Open floor plans allow your whole home to shine and accentuate the already beautiful components and design you have dispersed through your home. A perfect match for the shape-forward aesthetic that mid-century spaces promote. They’re also perfectly suited for dinner parties, entertaining, and social gatherings. 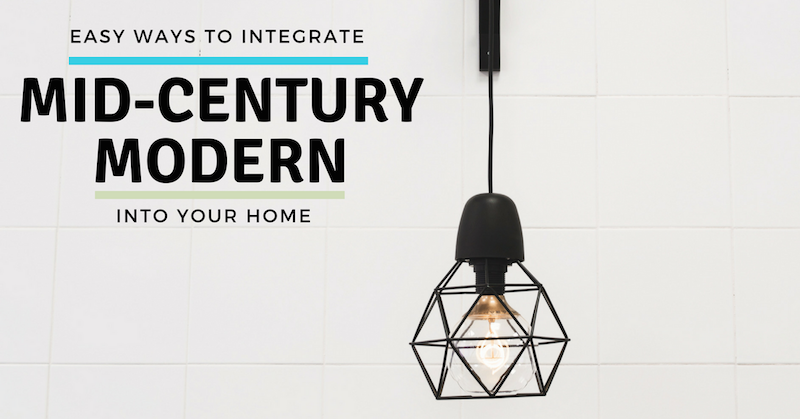 This means not only will you be taking a step towards mid-century modern design, but you’ll also be creating a home that will allow people to enjoy your home along with you. Open floor plans and natural light go hand-in-hand. If you have one, it’s best to accentuate the other. Make sure to not block any light with large cabinets or furniture pieces in the sunlight’s path. If you only have small windows now, consider remodeling your home to introduce some new natural light into the space. Not only will this make you feel healthier, but it will reduce your electric bill and accentuate your home’s decor, introducing a new design element into your home. House plants are great for any home, but they’re particularly complimentary in mid-century homes. In a design aesthetic that favors life, movement, and shape over flash, houseplants are the perfect piece of under-stated decor. Place them in a corner or find a place on your shelf! Built in wine racks utilize three fundamental elements of this design: entertaining, shapes, and function-over-form. Built in wine racks will not only look beautiful, but also allow you to store your wine and save space in other areas. It will also leave counter space for snacks served in 50s inspired serving wear! 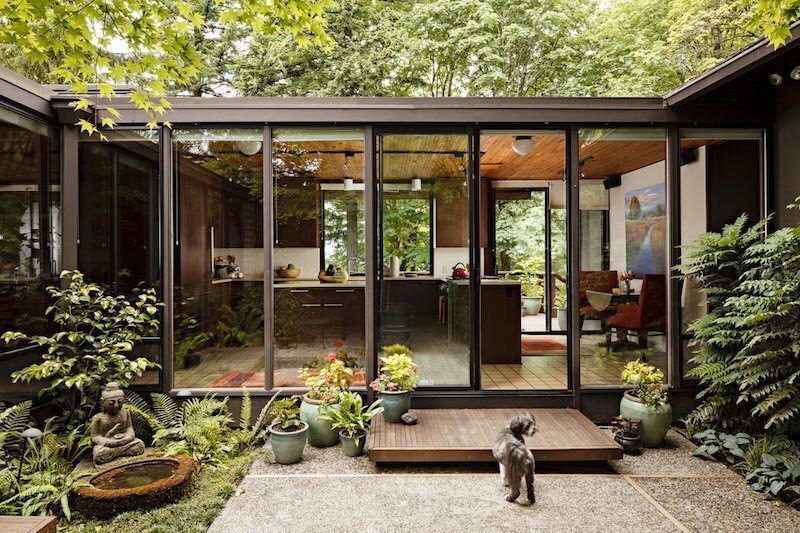 With functionality having increased importance in a mid-century modern design, utilizing storage space in the design of your home can add an element of simplistic functionality. Plus, the shapes will lean right into the aesthetic cohesion of the style. In addition to looking great, it will also help keep you house tidy (another element of the design) and make your house seem larger. Whether you already have them in your home or are lucky enough to find some (or know a kitchen remodeler who can do that for you), reclaimed appliances may be just what you need. Many old-school appliances work just as good now as they did when they came off the production line. They also look great and will fit right into your newly remodeled kitchen. Can’t find vintage pieces? There are a number of manufacturers who produce new vintage inspired pieces! Cabinetry is a wonderful place to utilize and contrast interesting material, given that it will take up so much space in your kitchen. While vintage inspired wood paneling always looks great and can look fabulous alongside tile backsplash, sustainable glass also offers a clean and a muted-just-enough look that will match well with a bold reclaimed appliance or other statement item in your kitchen. No matter what you do with your cabinetry, we recommended making them seamless to keep smooth lines through your kitchen remodel. 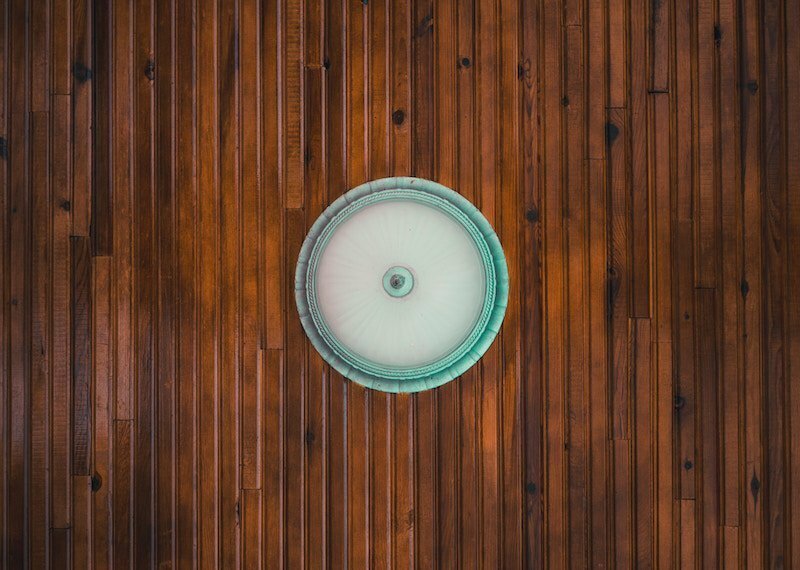 Wood ceilings can further extend the seamlessness of your home while still providing a bit of texture that can deepen its warmth. 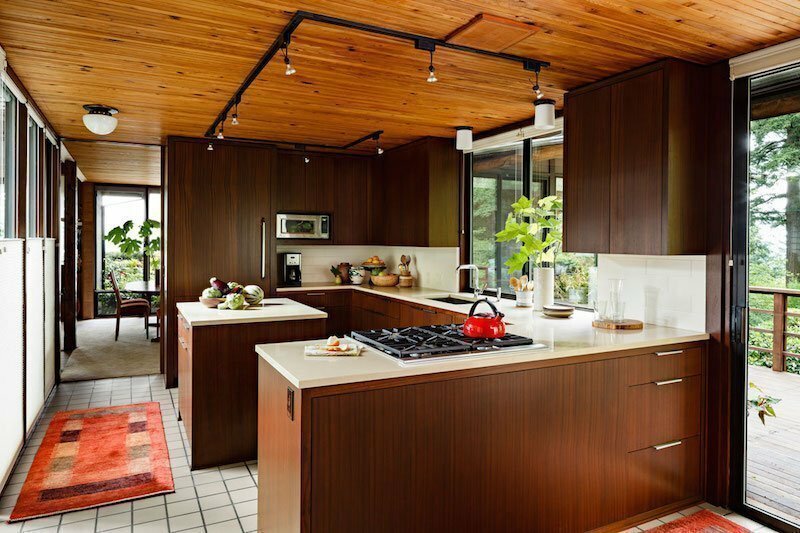 Given their unique stylings (you don’t see many wood panel ceilings), it will contrast nicely and give you the juxtaposition you need to create a unique space. Funky light fixtures are yet another unique item that will make your muted coloring (be it your ceiling or paint color) pop. Put it in the center of your living room, over the dining room table, or in your kitchen. Go for another interesting material (like milk glass!) and let the vintage charm of your home shine through. Looking to Update Your Home’s Style? At https://mosaikdesign.com/Mosaik Design & Remodeling, we love working with homes of all different types of styles (even if mid-century modern is one of our favorites). See something you’d like to integrate into your home? Give us a call at (503) 726-2222 with any questions. We can help you remodel or even just give your space a facelift. 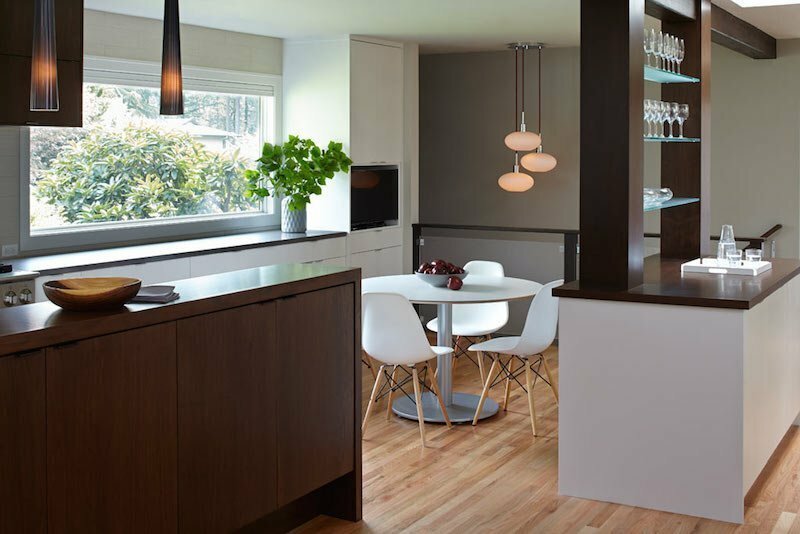 We have over 40 years of experience and was selected as a top 20 Interior designer in Portland for 2017. We’d love to collaborate with you to make your dream home a reality.